We are back with a brand new filmmaker with a brand new inspiring horror tale. Today’s filmmaker is Cory J. Udler director of the upcoming IDS RISING which is set to have its world premiere this weekend at the Oshkosh Horror Film Festival. Taking a break from the usual horror film, Cory takes a look at the television show that inspired his wonderfully sick and twisted mind. “Being 36 and having grown up during the now romanticized “VHS boom”, I was fortunate enough to be exposed to horror and exploitation films from every facet of the genre. I grew up in Altoona, Wisconsin, a small town, back then maybe 5,000 people. It was right next to Eau Claire, a town of over 50,000 that had all of the benefits of a large city without losing the community feel. Now, remember, in the 80’s and early 90’s every single building with lights had VHS rentals. Gas stations, liquor stores, laundromats. And each one of them got their selection from different distributors. Even the Kwik Trip a block from my house had VHS movies. Nightmare on Elm Street 3 and Return to Horror High were the two they had that I rented at least once a month. In order to rent movies from the stores you needed a valid ID. I was 10. No valid ID. My mom had the store put me on file saying it was ok for me to rent movies. Remember, this was back in the days when kids would ride bikes with no helmets and car seats went in the garage when you turned 2. It was a little more dangerous, and obviously, more free and exciting. In Eau Claire we had a virtual smorgasbord of video rental stores. Video Eye Video had all of the Faces of Death movies, Mondo Cane and a fantastic collection of Coliseum Home Video releases. These were the old WWF wrestling titles. Bloopers, Bleeps and Bodyslams was a personal favorite, featuring the wedding of Butcher Vachon which, if you have never seen, you need to YouTube right now. Video Vistas had Deranged, Rana Legend of Shadow Lake and more Full Moon/Wizard/Empire movies than you could stand. On Laserdisc. We didn’t have a Laserdisc, just the old VHS. Duke’s grocery store had Paul Naschy titles and the Jean Rollin classic (ahem…”classic”) Zombie Lake. We had a Best Buy move into town and it was there I discovered the movies of HG Lewis and Ted V Mikels. Now, keep in mind, when you’re 10, 11, 12 years old you just love the sensational titles and the over the top cover artwork. 9 times out of 10, the movies never could deliver what the box art promised. But that was ok. It was all about the overall experience. Seeing that big box VHS, the anticipation and expectation of what you were about to encounter when that tape went into the player. I devoured The Corpse Grinders, The Wizard of Gore, The Astro Zombies, 2,000 Maniacs and any other blood-soaked title I could find. Back to my original point, you rented the movies but had little care for the men (and women) who actually dreamt up the movie. Those who made that twisted idea a reality. This is where my inspiration to make films came in. I guess you could say I was a little spoiled as a kid. We had cable. It was a massive slide switching cable box with tangled masses of wires hooked up to our living room television set. For the life of me, I cannot remember the channel. I want to say it was Discovery or The Learning Channel. 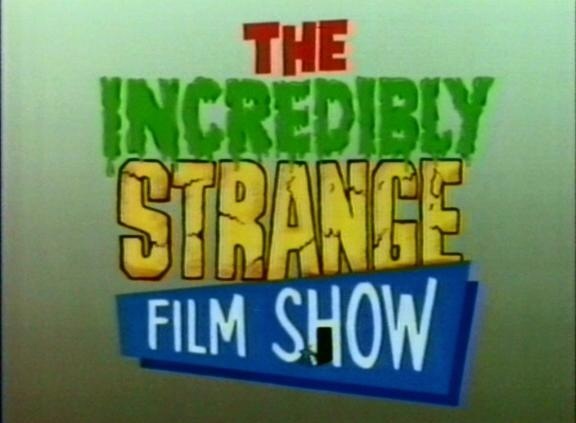 Anyway, I was 11 years old and one day found myself watching a program called “The Incredibly Strange Film Show” hosted by Jonathan Ross. The show was basically a one hour documentary on bizarre filmmakers and their movies. John Waters, Doris Wishman, Ed Wood, HG Lewis, Ted V Mikels, El Santo, Sam Raimi, and the list goes on. Remember, I had been watching Ted V Mikels and HG Lewis and Ed Wood movies for years before discovering the show. But it was the episode with Ted V Mikels that really struck a chord with me. The show started in the desert, with an accordion playing “Roll Out The Barrel” over Ross’s introduction. The camera pans to reveal a stocky, well built older man with perfect graying hair, a handlebar mustache and a massive boar’s tusk around his neck. This was Ted V Mikels, and yes, it was him playing the accordion. Throughout the show Ted was featured with a ventriloquist dummy, in his home which was stocked with “Castle Ladies” (worth a Google, kids) and in front of the camera talking about his unwavering love of making movies. It was then and there that I knew one day I would make a “weird movie”. For one reason and one reason only. Because that’s what I wanted to do. I have made 4 feature films in 4 years. Each of them taking me over a year from inception to completion. My last movie, “Mediatrix”, was 17 months. And we shot the film in 5 days. Not one film I have ever done has made me any money. I’m lucky in the fact that I do make enough to pay for the printing of the DVDs and that I have barely enough to make the next movie. But I am living that dream. That dream of making that “weird movie”. I’ve made 4 and I’m optimistic that I’ll get to make numbers 5, 6, 7 and 8. And I owe it all to Ted V Mikels and The Incredibly Strange Film Show. It was that program that showed me these movies were made by real people, with real passion, who do this for one reason and one reason only. Because they have to. It’s an obsession. A burning desire to make films and tell stories. As a side note, many years ago I was surfing around on the web and I did a search on Ted V Mikels. To my surprise, not only did he have a website, but he was still making movies. I sent an e mail to the contact address on the website, not thinking I would ever hear a response. Not only did I hear a response, but that e mail would turn into a wonderful friendship and working relationship with Ted. I have written 2 films for Ted and am working on a 3rd. If you would have told a 12 year old me that I would have written an Astro Zombies movie for Ted V Mikels, I would have called you insane. But that’s exactly what happened.